Bananas are elongated, slightly curved edible fruits with a fleshy outer peel that can be easily removed to expose the white to yellow flesh. They grow in clusters near the top of the fruiting plant, and come in a range of colors, including green, red, yellow, and brown (when ripe). A banana tree is the largest flowering herbaceous plant in the world. The scientific name of bananas is Musa acuminata. The fruit of the banana tree is eaten directly when ripe or is included in fruit salads, juice, and shakes. Unripe bananas can cause severe indigestion and should be eaten only in a cooked form. Also, bananas make a good topping for breakfast cereals or a snack for a quick burst of energy. Bananas are now grown in more than 100 countries around the world and can also be used to make fiber, banana wine, and are included in ornamental decorations. One serving or 126 grams of banana contains 110 calories and 30 grams of carbohydrates. They are a rich source of protein, potassium, and dietary fiber. They have zero fat and cholesterol, as well as negligible sodium. Thus, bananas have been considered one of the healthiest options for fruit consumption for many years. Their impressive nutritional content includes vitamins like vitamin C, vitamin B6, riboflavin, folate, pantothenic acid, and niacin, as well as trace amounts of other vitamins. Bananas also contain minerals like phosphorus, calcium, manganese, magnesium, and copper. Bananas are a rich source of potassium, so they reduce blood pressure. By relieving the tension on arteries and veins, blood can flow smoothly through the body and oxygenatevarious organs to increase their function. This can help eliminate atherosclerosis and the subsequent strokes and heart attacks that are so commonly associated with it. 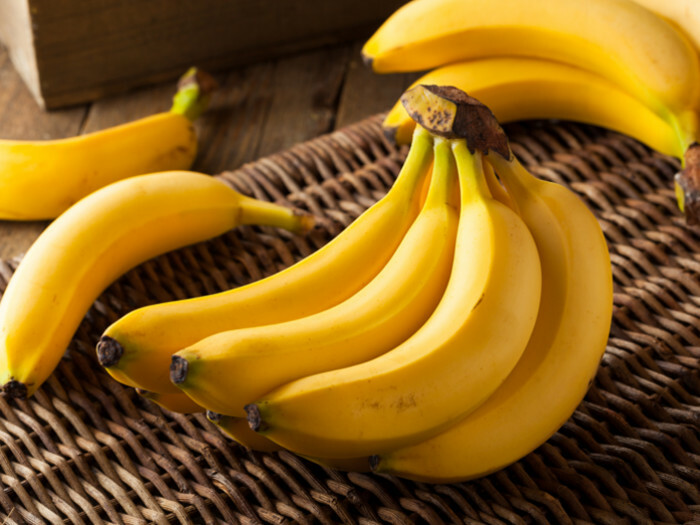 The fiber in bananas also scrapes excess cholesterol from the arteries and blood vessels and further reduces stress on the cardiovascular system. A banana a day keeps asthma at bay! According to research, children consuming one banana a day reduced their asthma risk by 34%. Bananas contain significant amounts of dietary fiber and therefore help in smooth bowel movements. The roughage soothes the excretion process and relieves a person from constipation. They also help in treating other intestinal disorders. The high fiber content in bananas help bulk up the stool and stimulate the body’s peristaltic motion, which facilitates bowel movements through the intestinal tract. This can help prevent colo-rectal cancer and reduce unhealthy digestive conditions. A banana provides about 3 grams of dietary fiber, which is beneficial for both type-1 and type-2 diabetics. Type-1 diabetics may have lowered blood glucose levels and type-2 may have improved blood glucose levels. The amino acid tryptophan in bananas plays a vital role in boosting mood and preserving memory. Additionally, magnesiumhelps relax muscles and vitamin B6 helps you sleep well. Bananas are useful for weight loss as one banana has approximately only 90 calories. They contain a lot of fiber as well and are easy to digest. Furthermore, they do not contain any fats. Therefore, an overweight person does not have to eat too much if their diet contains bananas because they are very filling. The roughage will also not make the person feel hungry by inhibiting the release of the hunger hormone, ghrelin. This will reduce overeating and also help in weight loss. The presence of fructooligosaccharide, a prebiotic, is a beneficial bacteria in our digestive tract that boosts the intake of minerals and nutrients by the body. Bananas are also linked to an increased absorption of calcium. Calcium is the most important element in the production and regrowth of bone matter in the body. It reduces our chances of getting affected by osteoporosis and natural weakness. The compounds inside bananas are anti-inflammatory in nature, meaning that they can reduce swelling, inflammation, and irritation from conditions like arthritis and gout. Bananas can be useful for weight gain. When consumed with milk, bananas help increase a person’s weight rapidly. Milkprovides the necessary proteins and bananas provide the sugars. Furthermore, since bananas are easily digested, an underweight person can gulp down 5-6 bananas in a day apart from the regular meals without facing indigestion. This leads to an additional intake of 500-600 calories, which is quite necessary for weight gain. Since bananas have the ability to provide instant energy, sportsmen eat bananas during the breaks in between games for an extra surge of energy. Traditionally, bananas have been used as an antacid food to soothe upset stomachs as they can also suppress acid secretion. The protease inhibitors in bananas eliminate the harmful bacteria that have been linked to the development of stomach ulcers. Cooked banana flowers help in providing relief from painful and excessive bleeding during the menstrual cycle and can relieve other menstrual distress too. Different parts of banana are used for cooking in different countries. The fruit is eaten raw or cooked. Some also eat the peel or the skin of the banana, which are also nutritious. The banana heart (flower) is also used in various curries and soups. The banana leaves are used as wrapping materials for baking and boiling various dishes. They are also used as biodegradable plantsor containers. The trunk of the plant is also used in a Burmese dish called mohinga, which is a rice noodle with fish soup. High potassium levels: Certain medicines consumed for heart disease and hypertension have the ability to raise potassium levels in the body. These include beta-blockers and diuretics. Therefore, those on medication are advised to consult a doctorbefore adding bananas to their diet. Gastrointestinal distress: Due to the abundant amount of fiber, eating too many bananas may cause various gastrointestinaldisorders. These include stomach cramps, bloating, gas, and many more.